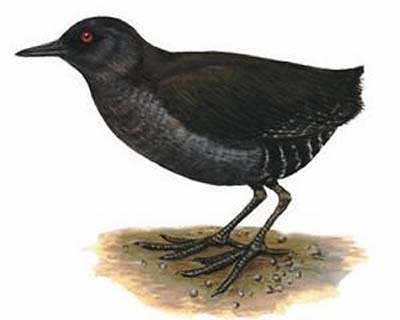 The Inaccessible Island Rail is now the sole member of the genus Atlantisia in the family Rallidae. There were formerly three flightless species, but two of them, A. elpenor of Ascension Island and A. podarces from St Helena Island, were led to extinction by introduced mammalian predators brought by humans. The third species, A. rogersi, survives on Inaccessible Island in the Tristan da Cunha archipelago. Goats and pigs formerly present on Inaccessible Island last century, destroyed most of the native vegetation. Conservation measures allowed their eradication by 1950. This rail is the smallest extant flightless bird in the world. The adult has hair-like plumage. The upperparts are dark chestnut-brown, whereas the underparts are dark grey, conspicuously and narrowly barred white on flanks and belly. The wings are reduced and the tail is short. The pointed bill is blackish. The eyes are red-orange. Legs and feet are blackish. The female is smaller and paler grey, especially on head, throat and breast. She only has faint brown tinge on the underparts. The juvenile is mostly black. The white barring is absent. The eyes are brown. Immature birds are duller than adults. No white barring in male but faint in female. The eyes are brown or red-orange. The Inaccessible Island Rail occurs on Inaccessible Island, in the Tristan da Cunha archipelago. The Inaccessible Island Rail frequents a variety of vegetated habitats at all elevations. They are more numerous in coastal tussock-grass and on the peaty plateau among patches of sedges, in fern-bush and in heath at higher elevation. It can be seen foraging on boulder beaches. This species often moves through natural cavities and small tunnels under the beaches, providing them protection and shelter, including during the breeding season. The Inaccessible Island Rail is a vocal species. The contact call is variable, with several quiet “tchik” and “chip” notes. The alarm call is a louder “chip”. During the threat displays, both mates give loud trill towards other adult rails. Calls can be aggressive, including loud squealing and twitter. 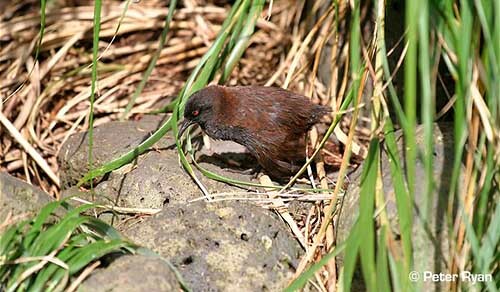 The Inaccessible Island Rail feeds on a large variety of invertebrates such as earthworms, centipedes, amphipods, also various insects such as beetles, moths, flies and caterpillars. It also consumes berries and seeds from several plant species. It usually forages in all habitat types, from boulder beaches to marshy areas, and even in short vegetation. It forages slowly, but when it is out of cover, it becomes extremely wary. It forages at night, but it appears more active by day. The Inaccessible Island Rail is monogamous, and mates have long-term pair-bonds. This species is not strongly territorial, but the area is defended by both adults against other adult rails by intense calling. They nest on the ground in the shelter of dense vegetation. Courtship displays are usually simple in the family Rallidae. This species is resident within the island and does not fly. The laying occurs between October and January. The Inaccessible Island Rail nests on the ground, and the nest is usually placed at base of clump of tall grass or ferns, or under dense vegetal cover. This structure is oval with an entrance on the narrower side, and an access, track or tunnel, through the vegetation over about 50 centimetres. This nest can be covered with some vegetation. Nest materials are collected on the site, and often include dead sedges or dead tussock leaves. The female lays 2 large eggs of about 25% of her weight. The incubation period is unknown but it is shared by both adults. At hatching, the chicks are covered with black down and have brown eyes. They are precocial and leave the nest within 24 hours. Both parents share all the nesting duties and feed the young birds. The fledging period is unknown. The chicks are often killed by the Tristan Thrush, but the bad weather could be another cause of mortality. The Inaccessible Island Rail is relatively abundant but it has restricted range on a small island. It remains vulnerable to accidental introduction of predators such as Rattus rattus. Inaccessible Island is a Nature reserve with restricted access. The population is estimated at about 8,400 birds, equating to 5,600 mature individuals. But currently, the Inaccessible Island Rail is evaluated as Vulnerable.